For quite some time now in the instances that I’ve been out at a restaurant, bar or liquor store, and have spotted the name Four Roses or seen the bottle on a shelf, I’ve always pointed it out to someone and have said, “I’ve heard it’s great, I should really try it sometime.” That “sometime” ended up being last night. If you are an American sports fan then you’ll know that October baseball becomes a wonderful thing when your home team is playing. I wanted to elevate my game watching experience last night by also enjoying great bourbon. For all those bourbon lovers out there let me go on by saying, if you have not tried Four Roses single barrel bourbon yet, then you are missing out. I will admit that I was certainly missing out on those other occasions that I missed the opportunity to try it. Four Roses is a Kentucky Bourbon and the bottle we purchased rang up around $37. To me that is a bargain price for smooth tasting bourbon. When opening the bottle I was first hit with the smells of sweetness and fruit. At first taste I had no words for this bourbon; it was so smooth that I had to take a few more sips before I could try and make out the different tasting notes. I enjoyed it so much that I actually ended up sampling the bourbon in three different ways. Taste: Was smooth with a nice slow burn. I tasted notes of wood and honey. Taste: Was still smooth but the water brought out hints of cinnamon notes. It was a bit chilly last night and we wanted to see how Four Roses held up in spiked hot apple cider. The Four Roses in the hot apple cider was GREAT. It didn’t over power the hot apple cider and it actually just elevated the flavors. They blended very well together and made up for a great cocktail. Something I recommend trying if you like hot apple cider and bourbon. Overall in all three instances the finish just left me wanting more. I’ve been accused of not trying out enough bourbon but if all bourbons are like this, then you better believe I will be trying out more of them. 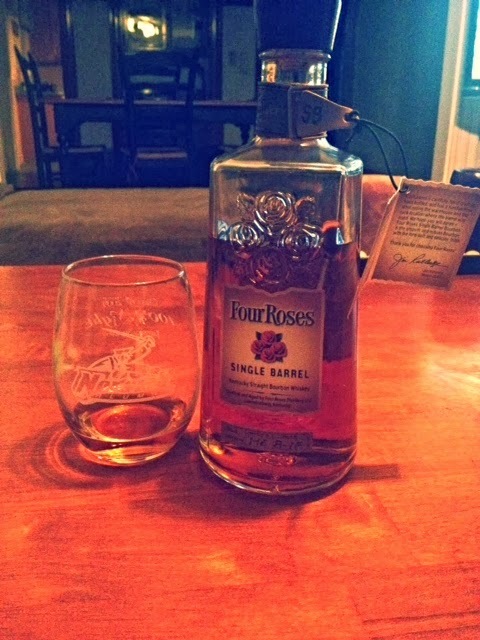 Now that I have tried this one, I am very much looking forward to exploring more of the Four Roses range. If you are looking to try new bourbon and haven’t tried this one, give it a world it won’t disappoint. Previous Post Scotch is whisky!